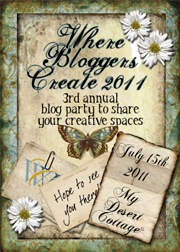 Welcome to my little corner of "Where Bloggers Create 2011"! 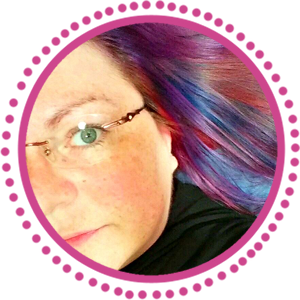 For those of you who don't know me, I'm Lori Anderson, and I'm a full-time jewelry designer, avid reader, junk collector, and lately, an insomniac. I absolutely love to write and this blog has been an incredible outlet for me. 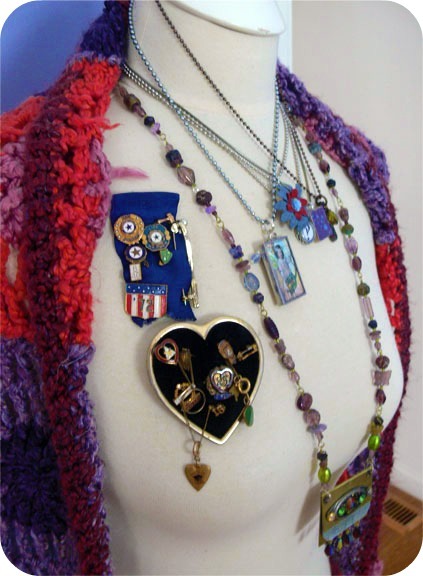 I think my posts are about as eclectic as my jewelry designs, and I hope, if you have time, you'll take a look around. Today, of course, is about where I create -- in this case, jewelry and handmade beads. I'm fortunate enough to have three different places to work, and I've decorated each one with things that inspire me and make me smile. I'm a firm believer that environment has a lot to do with a person's mood, so while most of the time I have "controlled chaos" going on, I'm still surrounded by color and interesting things to look at. First stop, my office. Here's where I do all my computer work -- web design, invoicing, shipping, and product photography. I also store all my design books, magazines, and catalogs here, but this is also the room that holds most of my vintage treasures. Bookshelf full of books, photo props, and random jewelry tools and supplies. Two of my three vintage typewriters, both of which work. My photography table, with a vintage tool chest opened up on the left (full of photo props) and my third vintage typewriter, which I love with a silly obsession. A full view of the photography table. Then, of course, Office Central. The messiest place in the entire operation. Plenty of storage. If it's a mess, nine times out of ten it gets hidden in a box. Lots of paper, labels, and the postal meter. 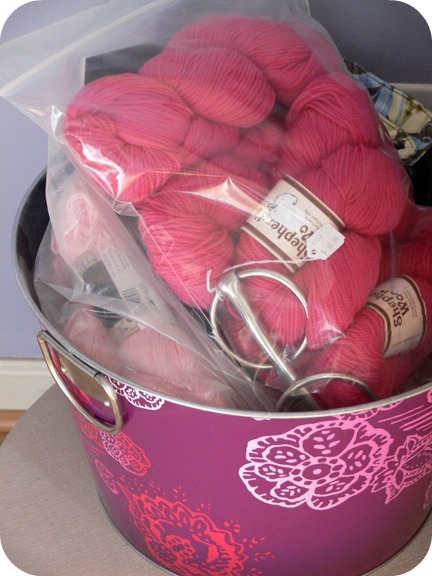 And another passion, knitting -- yarn stored in glass jars. Obviously, I spend a lot of time in that room! 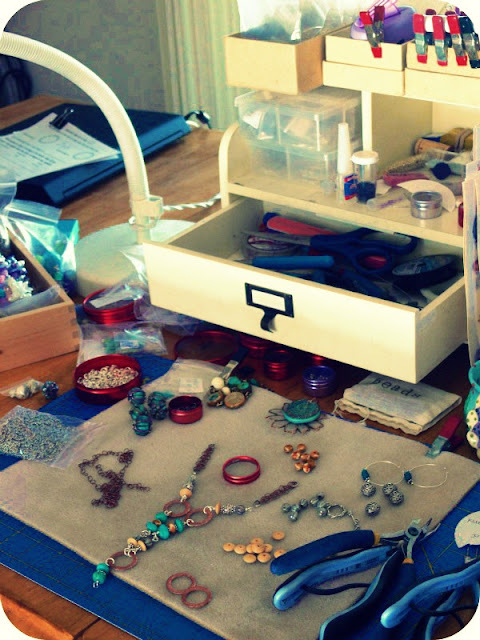 Now we move to the table where I make my jewelry. It used to be the kitchen table, but alas, no longer. I love being here, though, because I can be in the center of any family action. I'm also one of those sorts of people who likes to listen to the television while I'm working. It's not in front of me, so I don't watch it, but the voices are good company when my son's at school. Lately I've been a huge fan of American Pickers and Pawn Stars. 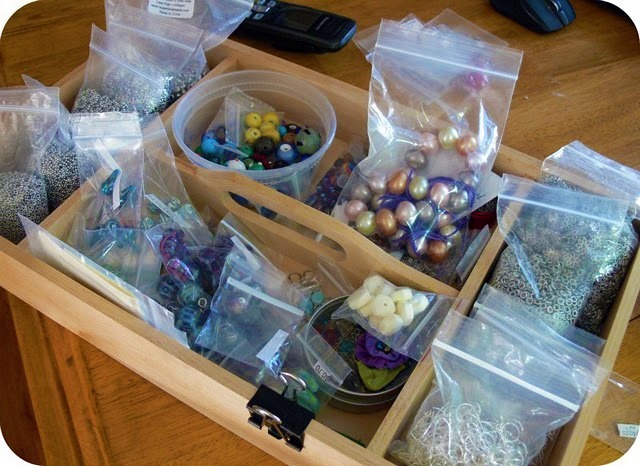 I have an enormous cabinet from Collectors Cabinets that houses all (well, almost all) of my beads. It's right behind where I sit, so all I have to do is turn around and there it is! The beading table, with a desk caddy I use for tools (found at Marshalls). with things I plan on working with immediately. 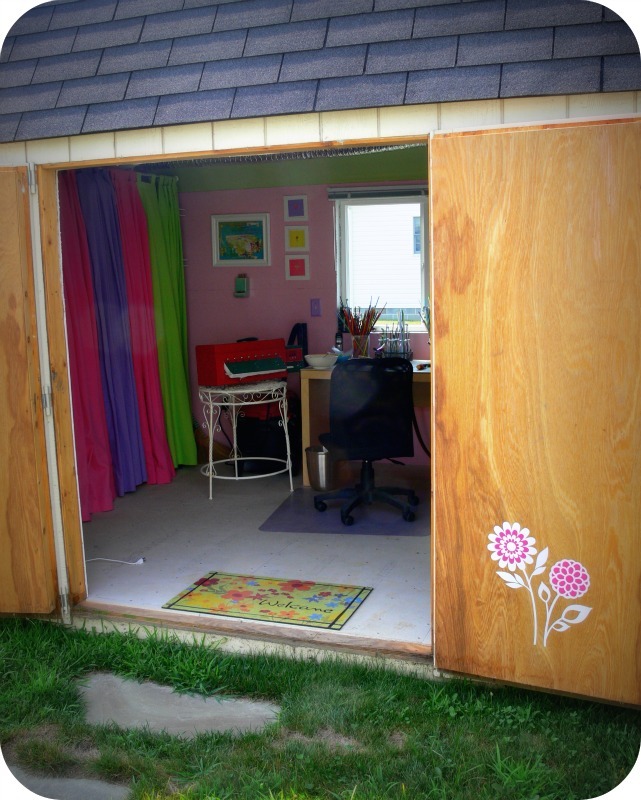 And now we move on to my lampwork studio, which is a converted shed in the backyard. It's been insulated, air conditioned, ventilated, and, of course, decorated. Here's where I make glass beads. As you can see, even the door is decorated. The kiln table is vintage iron. And of course, my torch had to be purple. Some controlled chaos at the bench -- dipped mandrels on the right, various types of glass in heavy-bottomed glass vases from Pottery Barn, and a tiled desk top (desk thanks to IKEA!). Another Pottery Barn find, and handmade marbles in the window. 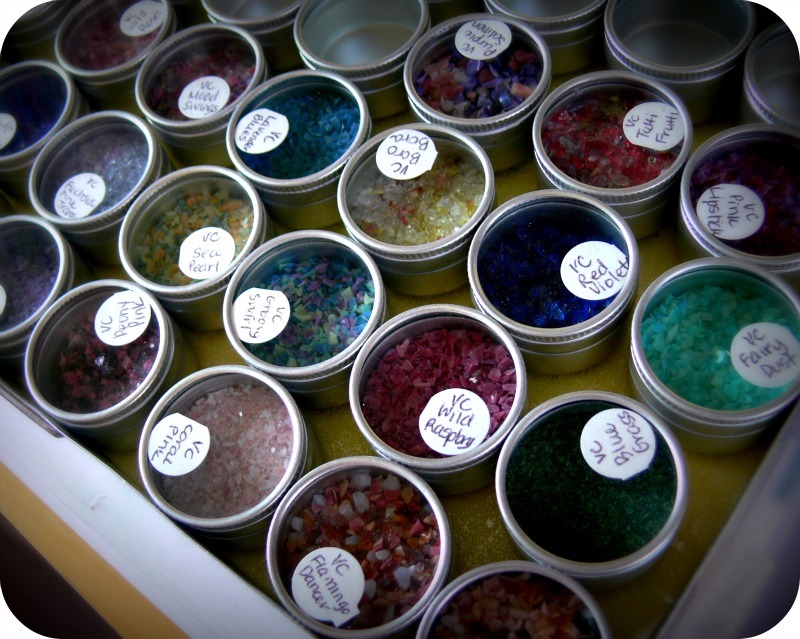 Frit, or ground up glass for decorating beads. Art, and a vintage match holder for lighting the torch. And I am so proud of this -- my glass storage. One day I'm sure it will be full, but I'm a beginner so I'm being conservative with my rod purchases. But the storage is an antique postal sorting station, solid oak, with slightly down-slanting bins. Absolutely perfect for glass rods. I walked around and around this forever at an antique store before finally mustering up the courage to ask the price. I got it for $100 and I am still elated. Behind and above the bins is storage, and at night I drop the curtains to keep dust off the glass. So there you have it -- my creative corners. I hope you enjoyed your tour! Be sure to visit other blogs by clicking here! I always love to get a peek into your work spaces. :) Just wanted to let you know - your post about your time in Korea is absolutely amazing! My respect! I know youre Love~ing your Lampwork cottage..its fantastic! But everythings wonderful about Glass lol! Btw nice torch how do you like it? Its just so much more inspirational to have all things just the way we want them. Now I need to go and read your post again lol. Goodness, I'm in LOVE with your work spaces! Pretty is an understatement. I also noticed you have art from Sascalia on Etsy - love her work but haven't gotten around to buying any yet. Thanks again for sharing, and if it helps any - your messiest work space = my tidiest space :-). OH My!! What a beautiful workspaces!! I loved seeing where you create. Some day I will have a separate room all to myself. OMG! What a beautiful operation. Beautiful places, Beautiful spaces. I'm interested who did the art work hanging on your wall. It looks like one of mine. Thanks for a the tour. I'd pay admission to see it in person. Your place is beautiful! I love your typewriters! Especially the one with the wooden case! 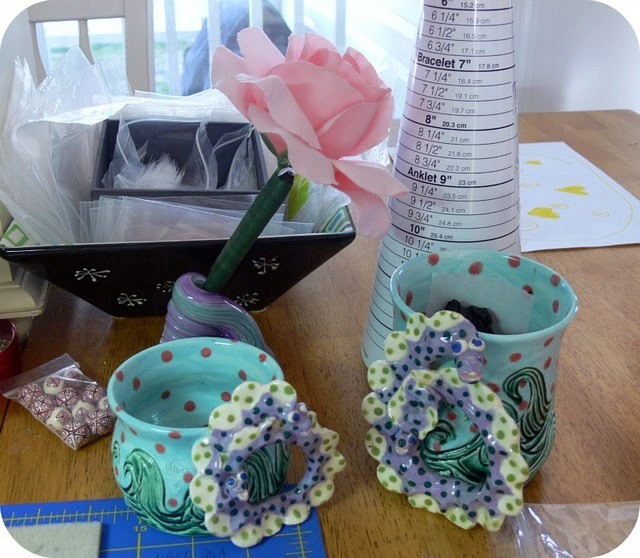 Oh what fun...your studio looks like a cheerful place to create beauty! Love the shed turn studio...now that's some serious awesomeness! Antique typewriters are the best. You have some real beauties. Thank you for visiting my blog too! So wonderful to meet other bloggers!!! You are amazing!! Thanks for visiting my blog too! I knew I wound meet some wonderful people, like you! I love that you've made each work area gorgeous not just utilitarian. If you ever tire of beads, interior design could be your next creative outlet or career! But please don't tire of beads! Lori, I love your spaces, Your jewelry is so gorgeous. I was wowing at your sweet antiques and lovely decorated vingettes...then you took me to your Glass studio. WOWZER what a wonderful thing to do and such a perfect space. Drooling over your post boxes too. Thanks for sharing, keep smiling and creating. $100? That's highway robbery! Good job. 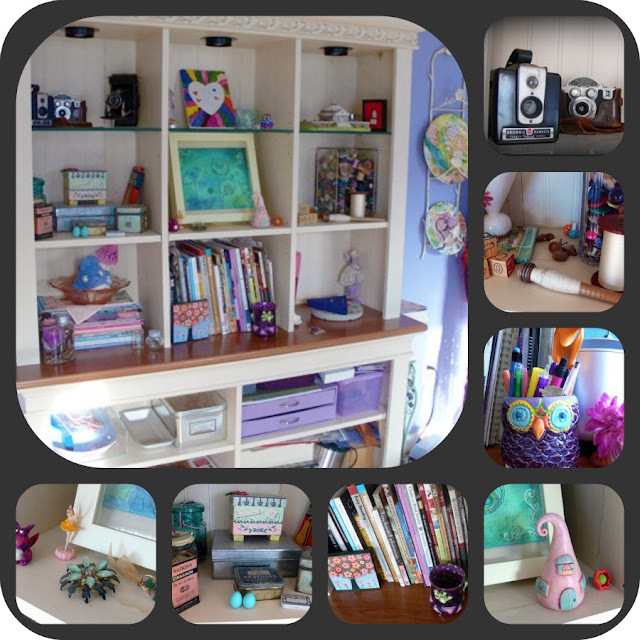 Your space is just like you- colorful, beautiful, creative and fun. 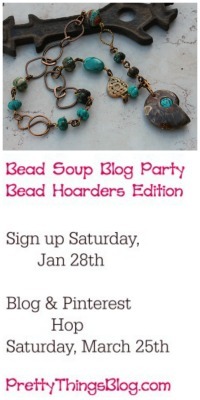 It's apt that you have to be right in the middle of things at your kitchen table as you're the hub of a wonderful group of beaders/bloggers with your Bead Soups. I LOOOOVE the color of your walls and curtains. Just a lovely space to spend your time. You've done a fantastic job, sugar! 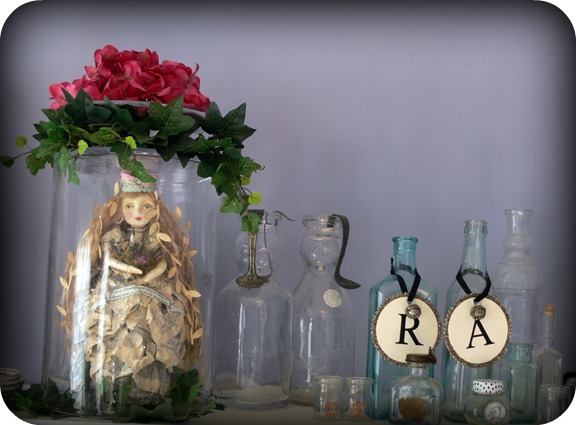 I love love love your blog and really enjoyed seeing your creative space. I want to come over and PLAY! Fabulous, Fabulous! I wish I could come over and watch you make those lovely beads!!!! I see my little soldered charm hanging there and feel so special to be included. Thanks Lori, your space(s) are as wonderful as your beautiful beads!!! This has got to be the most amazing set of spaces I've ever seen...! Well done! Love all the bright colors and the pink typewriter is a huge hit with me. Your studio reminds me of a flower garden. You have created a wonderful space and thanks for sharing it today. Wonderful places to create in and so much space. Thank you so much for the tour. Wow! I love your work spaces!! you are very fortunate to have so many. I am renovating the spare bedroom, and it will have a space for me to bead, and I am so anxious to be done, but it takes time and i am almost there. Our daughter moved back home for a bit, so at some point I will have a spare room and a creative room...all in good time. Thanks for sharing yours! Awesome spaces! Love that postal sorting piece...I have a smaller similar piece. They are such wonderful storage/display pieces! I think your owl pencil cup is so cute and I'm with you...a pink typewriter is totally worth obsessing over!! I really enjoyed my visit! Love visiting your blog, anytime! You are such an interesting lady! Did not know you made beads, too. I love all of your creative spaces. I just started looking at tutorials on bead-making, and it looks like so much fun. Your space, so colorful, makes me want to try it out even more. I applaud your husband for being so supportive of your ventures, that makes you an even more fortunate lady. Have a great weekend, Lori! Also, give that precious Zack many, many hugs and kisses!! Little ones grow up so fast, believe me, I'm on the edge of being an empty-nester! God Bless you! It's so lovely to see where you work! I think your lampwork studio is my favourite - so many beautiful colours! And is that one of Kerry's artworks I spy in the first photo collage? Thank you for your kind comment at my blog. I love your colourful spaces! I too am a colour freak and there are so few of us on the blogs! Lori, it's always fun to see shots of your studio...and it was cool to get to see it in person too. So much to see and touch and and admire. 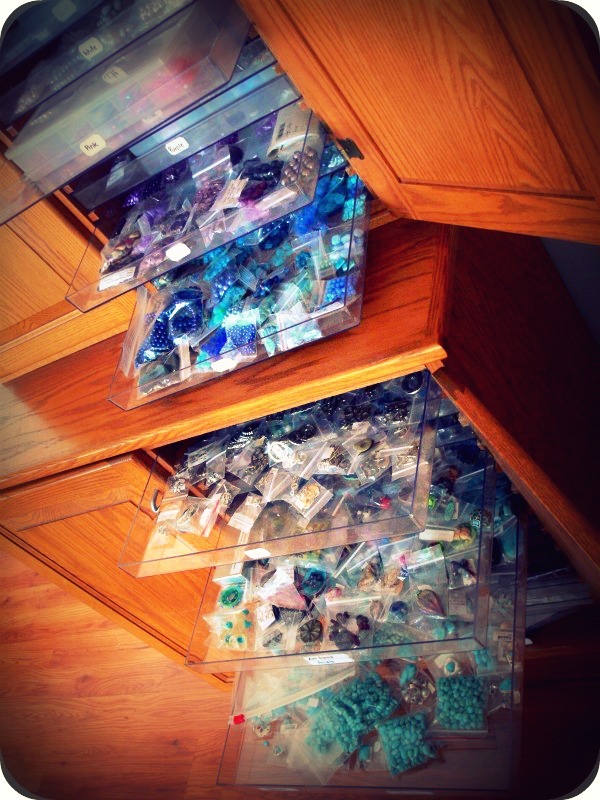 One of my favorite items is your awesome bead cabinet!! Sometimes practical is really the way to go (especially with that many beads!). I love you wall color, and the effect it gives: light airy refreshing. I'm a new follower. You have marvelous creative spaces and I love the way you photographed it all. I, too, am smitten by that pink typewritter - oh.my.gosh! Thank you for visiting my blog and inviting me over. What lovely spaces you have, I am intrigued by lampwork beads! I can't believe I forgot to take a picture of my dressmaker dummy :( it helped me through university lol. And thankyou for visiting me too... You are very inspiring. Love all the colors and the things you decorate with. 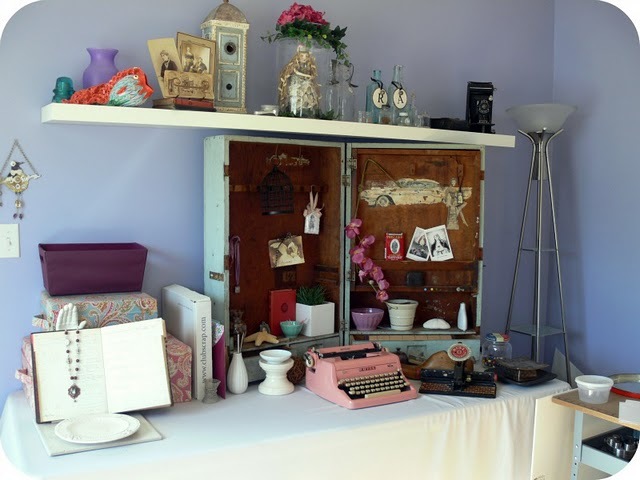 what a beautiful space you have and so organised to I love those vintage typewriters I really love the pink one! thanks for sharing all your photos with us all. I love all of the bright colors! The typewriters are fabulous and those purple glasses, too cool! Awesome room and I'm especially jealous of the back yard "shed"....I've wanted one forever! oh,.zi love it all!!!! those typewriters are the best!! what a wonderful place to create! Don't you just love haing such a wonderful refuge!!! have a great weekend and thanks for the view into your world! Wonderful space! Love that pink typewriter!! Thanks for stopping by my blog. No that is not my house in the header.....mine looks much better than that! Thanks for sharing your space! Wow how interesting your spaces are.Lovely I love all your collectiable. I really, love your glass containers and ladels. I will be back to visit your blog in the future. Well, I am impressed to say the least! I just love all your creative corners. I'm in love with the vintage typewriters (My first typewriter was a Royal). Actually, I'm in love with everything! thanks for stopping by my blog as well. Wishing you a great day. Lori, thank you for visiting my creative space, because it gave me the chance to see yours -- WOW! 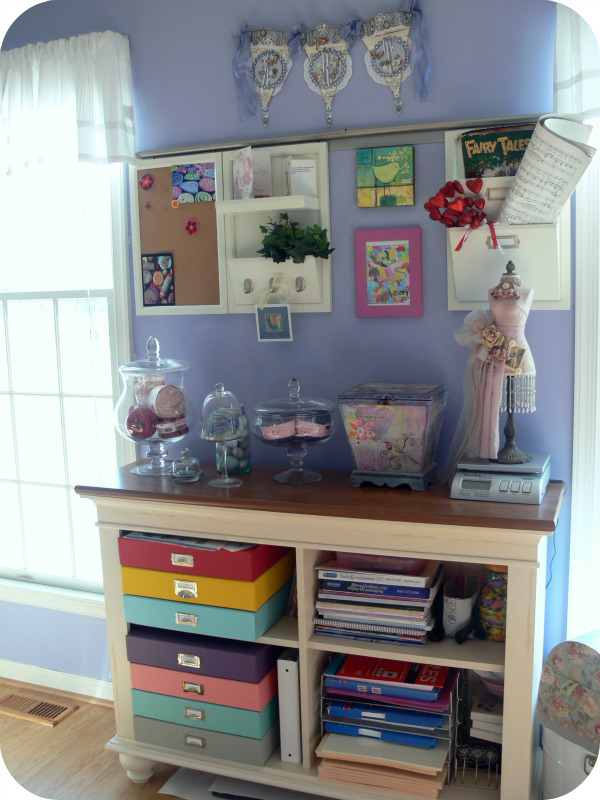 You say you're not tidy but really, your space is beautifully pulled together and so full of color and pretty things. LOVE the typewriters!! Oh my stars..... What a clever lady you are and what wonderful working spaces. 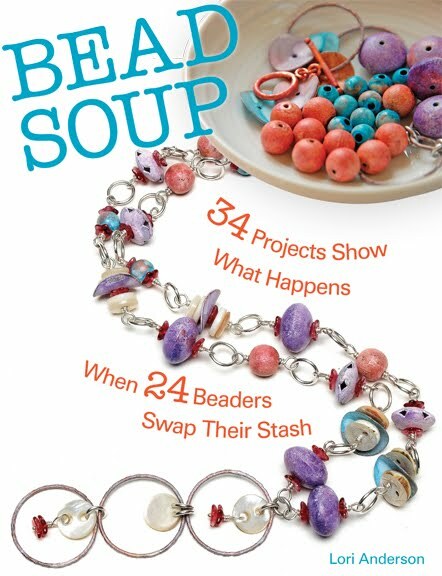 Someday I'd love to learn to make lampwork beads.... somehow I don't think the kitchen table would be quite right though.... and my garage??? Full to the brim. Thanks for sharing your spaces.... THREE of them.... now, that makes you one lucky chickie. Lori. I love all of the creative ways that you have arranged your work space. I be back. I was glad that you came to visit me. Thanks for visiting ...I was over at Deb's all day today...so not much blog hoping tomorrow & I'll be away all day...so I may get to a few tomorrow when I get home...then it will be Sunday before I really get to visit every body. Love both of your creative spaces. 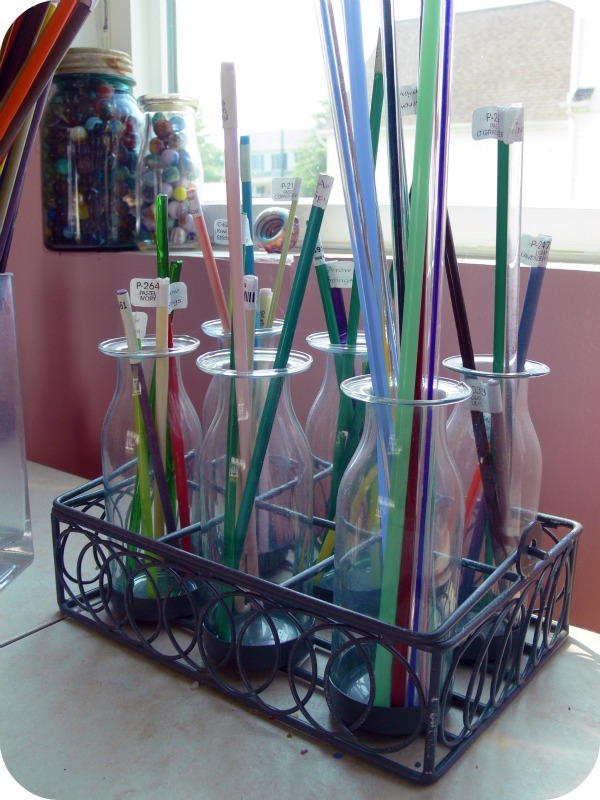 Totally fascinated by the glass rods that in your hands turn into to gorgeous beads. TFS! Hi Lori, Your creative spaces are wonderful and so well put together. I love your cubbies for the rods. This is perfect. Coming to visit has made me so inspired. I really enjoyed my tour of all of your spaces. I was very intrigued with all of the different mediums you work in. LOVE the antique cubby for your glass rods. It's a beautiful piece and I think you got it for a fabulous price. I also love those vintage typewriters. I have a couple that I love to display. Thanks for sharing all of your spaces. 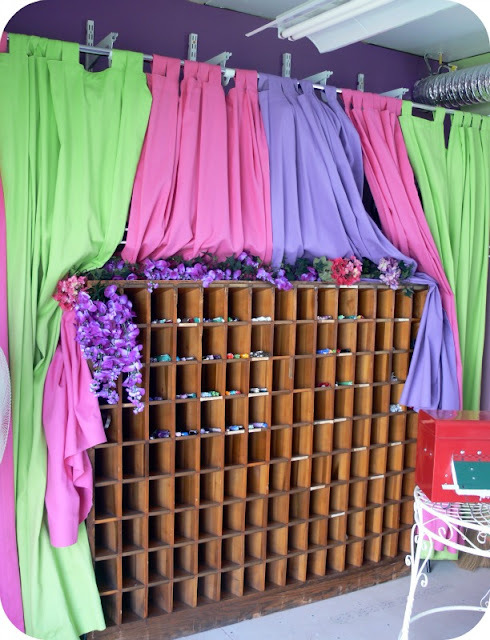 It is a pleasure to visit your studio and marvel at your organization and wonderful use of color! That pink typewriter is the cat's meow! I have a friend here that would love to get her hands on that! Thank-you for stopping by my blog and your sweet comments on my work and studio! Your blog looks very interesting and I plan to stop back for more visits! Holy cow! What an amazing space- you are one busy gal! How was it to get back into it after your year off? Thanks for sharing! What a wonderful set of creative spaces! I love your typewriters and your organization. You really got a deal on the postal cabinet. I've been thinking about a storage shed in our backyard too, but for my husband, not me. He does science and electronic things. Amazing space you have my friend. I LOVE THAT CUBBY. A bigger/larger version of the one I use to hold lace. I love your jewelry...could totally get lost in there! Blessings to you...thank you again for visiting me today. I'm honored you stopped by. I love hte purple and the cubbies - and the vintage items!!!! What a great space! 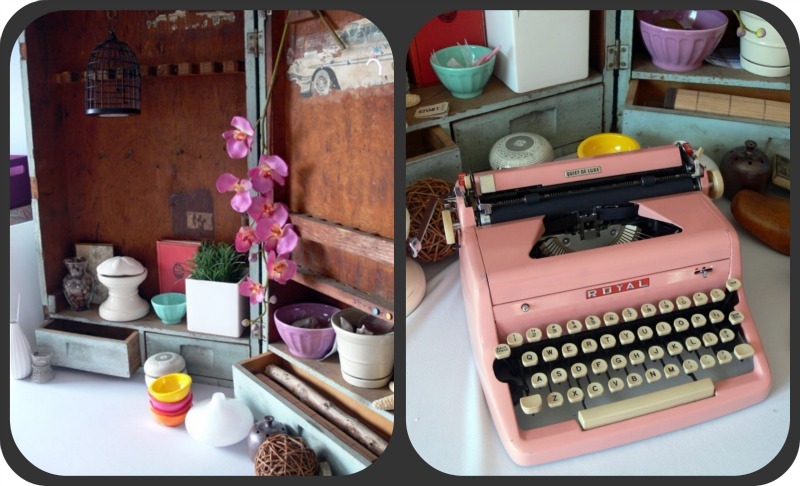 Love your pink typewriter, and that glass storage bin is fabulous! O.K., YOU are on my blog list starting AFTER I am done leaving you a comment! THANK YOU for coming over; I think you may have found me through my BBF Violet, from Creating Beauty. OH MY GOODNESS, your studio is stunning my friend...just professional in every way. Violet and I are constantly sharing our glitter projects and I draw and write and make books, but I am a full-time teacher during the school year. Your space is incredibly lovely and I need to know.....DID YOU MAKE THAT SPLENDID DOLL in the jar, wearing what looks like a paper dress???? Hi Lori, Wow you have a really cool space, and I love all your beading stuff, especially the glass, that is so cool! I too have a Ball jar full of old marbles I bought at an antique shop. I am now following, but will come back and take a closer look soon. Thank you for dropping by my blog! oh Lori- you are always an inspiration to us. I have been beating myself up lately since I do not have a work space of my own. I do have storage in the corner of my family room and I also work at the kitchen table listening to American pickers and Pawn Stars, I also listen to Deadliest Catch. It is nice to hear you started like me. How lucky you are to have these beautiful places to create all your things. I particularly like the cottage with its large window. Thanks for your kind words about my creative space. I love it! Whar a wonderful space - and those cubbies! What a great find! And the typewriters- I love anything vintage! Wonderful job! I just love the diffrent vintage things you use for storage. I particularly love the postal sorting cabinat. Been reading your blog.....very nice. 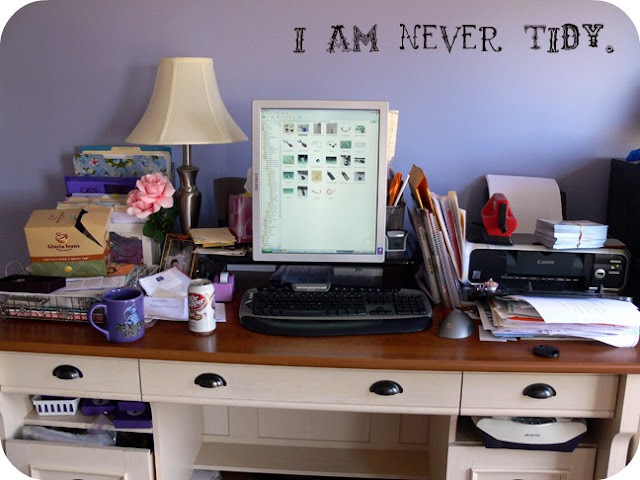 Your work space is gorgeous, even if you think it's messy....I LOVE it!!! I literally got a big lump in my throat to see that piece in your space all framed and pretty....you have no idea the transition I have underwent mentally and artistically to get to this place where I am now and to see that on your wall...well, I am filled with joy and sorrow all at the same time....it is amazing and I am so happy we are friends. I am truly grateful for this moment. I always find it so much fun to see how other people work. I love your "organized chaos" -- looks perfectly organized to me. And all the fun little doo-dads. You've inspired me to do a similar post this week on my blog. Mine's a little less "finished" but still, happy places to work (I'm spread out in several places, too). Fun! I can't even begin to take that all in. I'm green with envy! Wow. You're amazing! What great creative spaces - lots of light and colour! Making glass beads must be wonderful fun. What a treat! I've seen parts of your studio but never the whole deal. Wonderful spaces to work in. Thanks for the tour! I love your space/spaces. And all of your unique/vintage finds. What a great place to get inspired and work. I'm in awe of your neat and tidy studio. My place looks like bomb of randomness exploded all over. No one will ever get a "studio" tour at my house...it's the door that must remained closed when company comes! Your studios are amazing, I think they are wonderfully organised and I love all the storage cupboards. Your lampwork studio is incredible, my Mom went on a workshop to make lampwork beads and I really admire anyone who can do them. I think I would want to be touching the bead all the time as that is how you work when making teddy bears. The old postal sorting cupboard is just perfect for storing the glass, all the colours of glass look amazing. Thank you for visiting my small space. Oh, you do create pretty things, and your creative studio is wonderful. I love all the color. You are a true artist. I love when you pull back those colorful curtains, you are able to to see the old printers boxes. What a perfect storage that would be. Looks very inspiring! Two very nice studios to be creative in! Thanks for sharing with us, Lori! You've created such beautiful spaces to work in - such a treat for yourself!! Wow..what great creative spaces you have! Thanks for stopping by my space. Whata lovely space, i want one just like that. And love the cabinet, great idea. Wonderful! 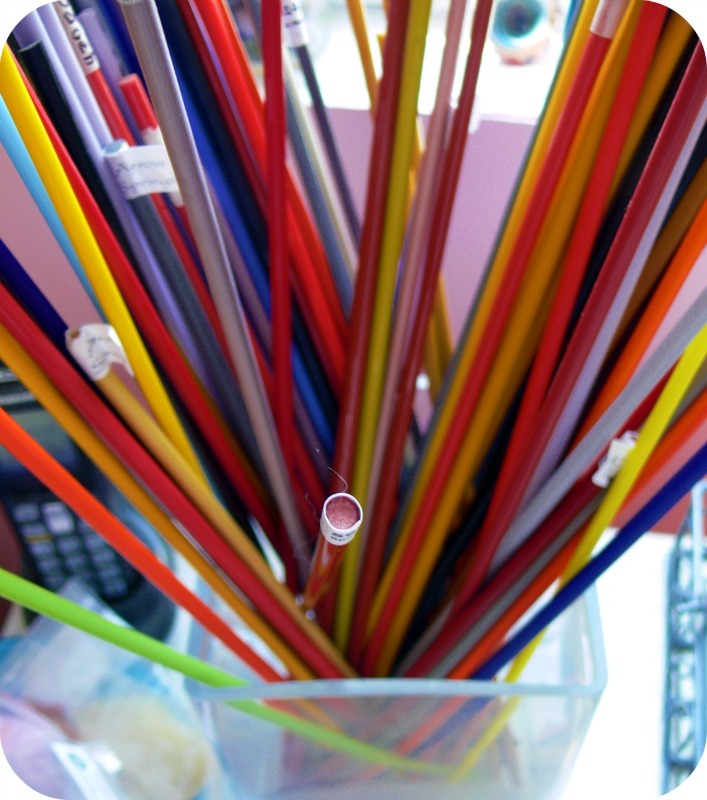 I love your use of color and they way you've organized everything! Thanks so much for sharing your space with us. I Love your Studio!! Isn't Fun to See where everyone Created their Art! You can Where their Inspiration Comes from and each Studio is so very Unique!Thank You for Sharing and Your Visit! !Come and Visit again soon! I LOVE your cubby shelve! I want one just like it! 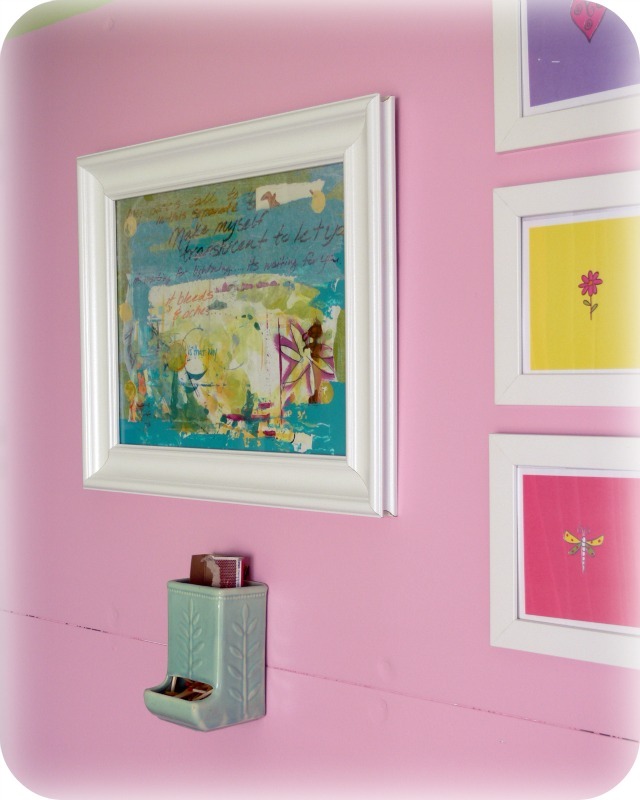 Your studio is beautiful, I love how you display your son's artwork around. Wow! Talk about creative space! Everything is set up beautifully. This is so cool Lori! 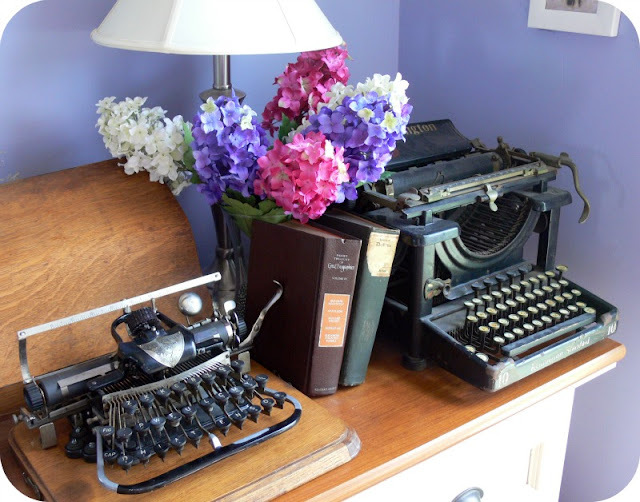 Love all of your space...especially those old typewriters and the glass rod storage peice! Beautiful! Thanks for stopping by & happy creating! Thank you for sharing your creative spaces with us. I hope you have time to stop by and visit me...there's a little giveaway at the end! What fantastic spaces, Lori!! 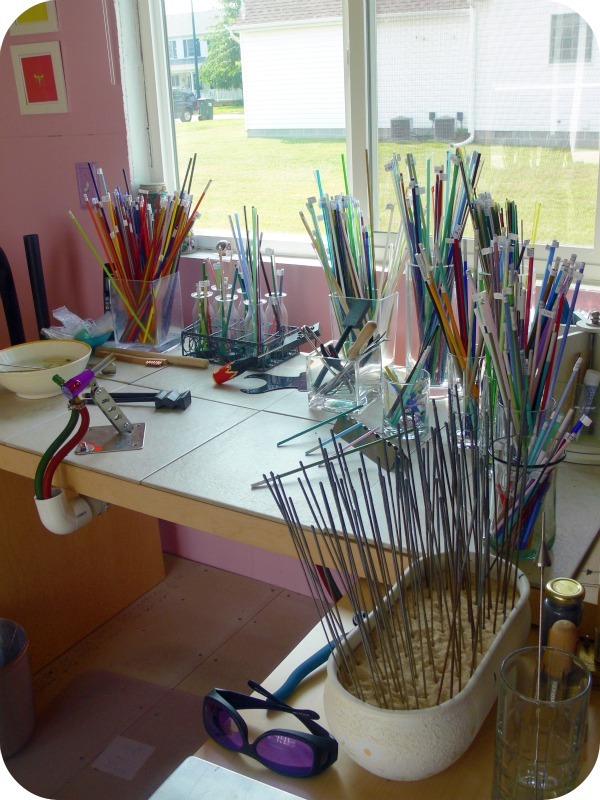 I'm particularly in love with your lampworking studio out back - SO FUN. Lori, you are really blessed. Thank you for sharing your work spaces! Loved your tour. What wonderful spaces. I really liked your glass containers with the ladels. Interesting! Enjoyed stopping by and Thanks for visiting mine! love both of your creative spaces. Am I jealous? you bet. WOW!! What a great space!! Love you vintage cameras and your vintage typewriters too!! You loved my purple, I love your pink! Hi Lori - you have so many beautiful displays in your craft room - I am in love with your knitting needles and your beautiful beads. No wonder you like to spend so much time there! You are blessed to have such a great place to call your very own! Your lampwork studio is adorable! My favorite part of your studio is - COLOR! It makes me feel happy! I finally made it to your blog!!! I'm slowly going down the list!!! I love love your pink typewriter, what a treasure!! !I am so impressed with crafters who make glass beads...that is an art I wish I knew how to do!!! I love your colorful place!!! Your photos are beautiful! I love the vintage typewriters. You have some great vintage treasures! Thanks for the tour and for visiting my blog too! OMG that rod storage cabinet is to die for, even if you don't use glass rods!!!! And for $100? I would have guessed ten times that. Thanks for visiting my blog. How wonderful!!! It's so bright and sunny! 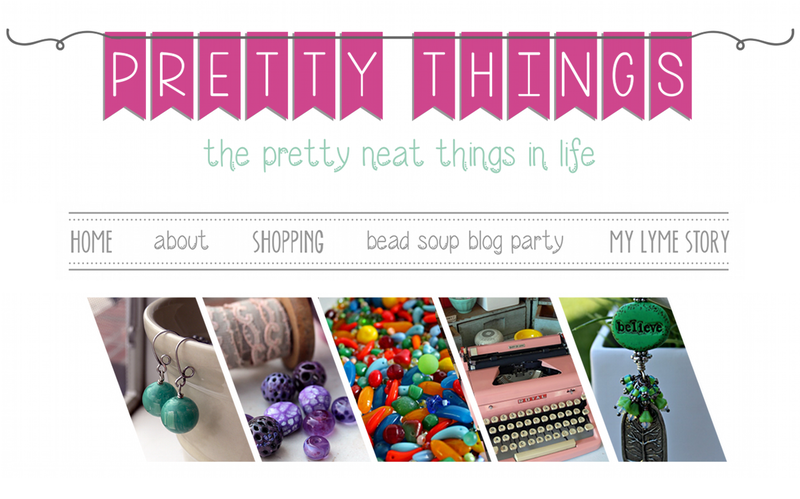 I love the purple color on the wall where you blog and the postal sorter is TDF!! I can't believe you only pain $100.00!!! Thank you so much for sharing it all with us! 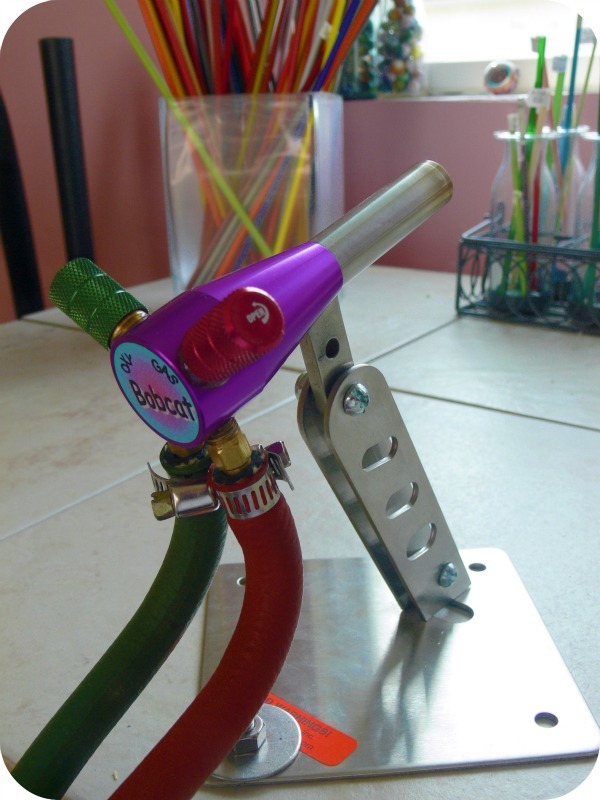 Love the purple torch and that you like to bead in the middle of it all. I have my giant new beading cabinet in my great room. People always think I should take over the office just off that room, but I want to be in it all. I have been beading on my kitchen table too for years. I have literally taken my hand and pushed the stuff aside to serve dinner on half the table. The winner, and a prayer request, please.